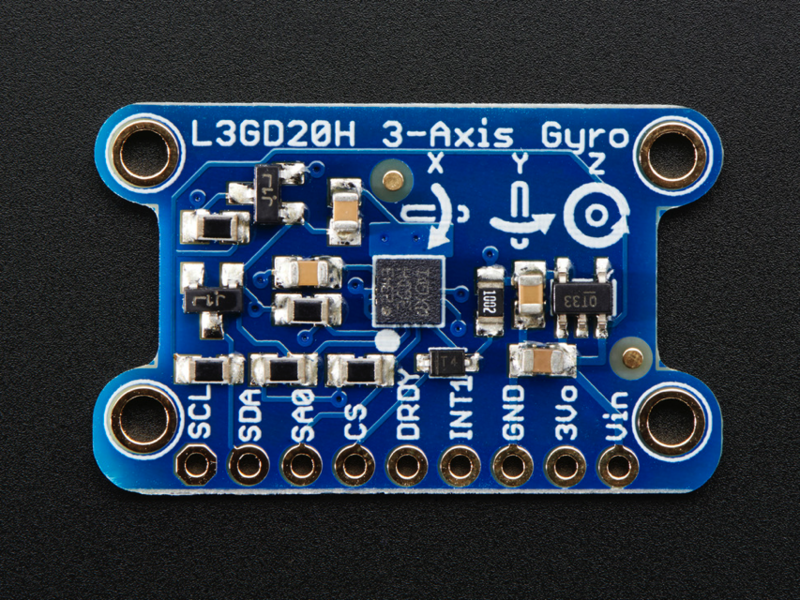 UPDATED PRODUCT – L3GD20H Triple-Axis Gyro Breakout Board – L3GD20/L3G4200 Upgrade « Adafruit Industries – Makers, hackers, artists, designers and engineers! 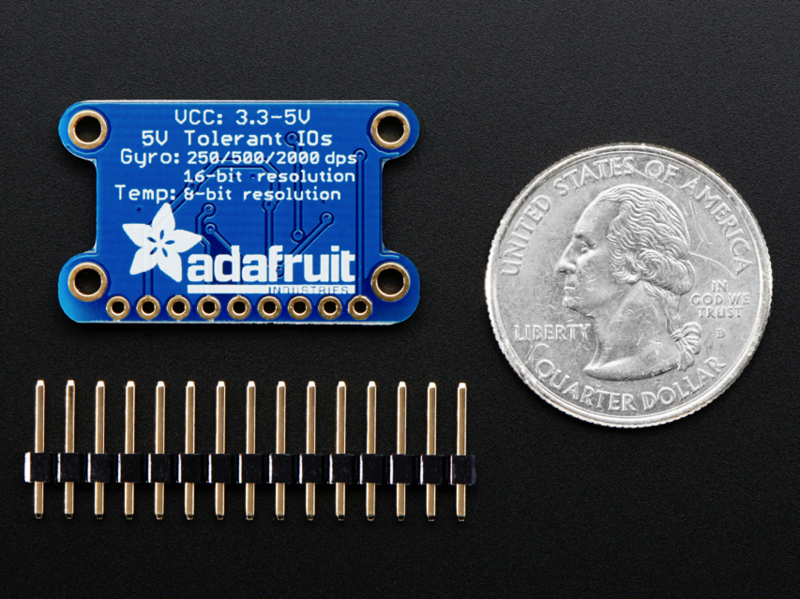 As of Oct 1, 2014 we are now shipping this board with the next generation L3GD20H chip rather than the L3GD20. Its nearly 100% code-compatible (the ID register has changed) and has better noise rate density (0.011 dps/Hz vs 0.03 dps/Hz). A gyroscope is a type of sensor that can sense twisting and turning motions. Often paired with an accelerometer, you can use these to do 3D motion capture and inertial measurement (that is – you can tell how an object is moving!) As these sensors become more popular and easier to manufacture, the prices for them have dropped to the point where you can easily afford a triple-axis gyro! Only a decade ago, this space-tech sensor would have been hundreds of dollars. This breakout board is based around the latest gyro technology, the L3GD20H from STMicro. It’s the upgrade to the L3G4200 (see this app note on what to look for if upgrading an existing design to the L3GD20) with three full axes of sensing. The chip can be set to ±250, ±500, or ±2000 degree-per-second scale for a large range of sensitivity. There’s also built in high and low pass sensing to make data processing easier. The chip supports both I2C and SPI so you can interface with any microcontroller easily. Since this chip is a 3.3V max device, but many of our customers want to use it with an Arduino, we soldered it to a breakout board with level shifting circuitry so you can use the I2C or SPI interface safely using a 5V interface device. We also place a 3.3V regulator on there so you can power it from 5V. Since we expect people will want to attach it firmly to their project, the PCB comes with four 2.1mm mounting holes. Use #2-56 imperial or M2 screws screws. Getting started is easy – simply connect SDA to your Arduino I2C data pin (On the UNO this is A4), SCL to I2C clock (Uno: A5), GND to ground, and Vin to 3 or 5VDC. Then install and run our easy to use Arduino library, which will print out the XYZ sensor data to the serial terminal. Our library also supports SPI on any 4 digital I/O pins, see the example for wiring.